7 It took Solomon thirteen years, however, to complete the construction of his palace. 2 He built the Palace of the Forest of Lebanon a hundred cubits long, fifty wide and thirty high,[a] with four rows of cedar columns supporting trimmed cedar beams. 3 It was roofed with cedar above the beams that rested on the columns—forty-five beams, fifteen to a row. 4 Its windows were placed high in sets of three, facing each other. 5 All the doorways had rectangular frames; they were in the front part in sets of three, facing each other. Given very similar massive megaliths are found at the Temple Mount in Jerusalem, also attributed to Solomon, it seems very likely they are reffering specifically to Baalbek. As far as the dating of the writing of the Book of Kings, scholars apparently agree at the very least that it dates to the 6th century BC, i.e. a few centuries before the site was occupied by the Romans and roughly 500yrs before the building for the Temple of Jupiter. megalomaniac design and construction technique in the first half of the first century AD. The most famous example may be the trilithon forming the middle layer of the western temple podium by three blocks of 4 by 4 by 20 meters size. The podium can be considered as an attempt to hide the older, inconveniently shaped temple terrace behind a podium in fashionable Roman manner8, consisting only of three layers of masonry at the height of twelve meters. Just in front of it, the new sanctuary design created a partly two storey platform of about 100 x 120 meters, embraced by two low walled courtyards to the east and west. The temple itself, located on its giant podium inside the western court, was nearly finished in the year 60 AD, as an inscription proves9. So, we have at least one source that predates the Romans alluding to massive stone construction at what we assume to be Baalbek, known in the Bible as "Balaath" according to some scholars, and archeology that confirms the existence of pre-Roman monumental architecture under Roman foundations. The Epic dates to at least 2100BC and if scholarly opinion is taken at face value Gilgamesh ruled sometime between 2500-2800BC. Regardless, this tale well predates the Romans at Baalbek by at least 2,000yrs. "Hugeness", , a ferocious giant. The "Land of the Cedars" is of course Lebanon (Byblos). cedars, the dwelling-place of the gods and the throne of Ishtar. Hermon and Lebanon used to tremble. Now the mountains were moved and all the hills, for the guardian of the forest was killed. They attacked the cedars, the seven splendours of Humbaba were extinguished. So they pressed on into the forest bearing the sword of eight talents. They uncovered the sacred dwellings of the Anunnaki and while Gilgamesh felled the first of the trees of the forest Enkidu cleared their roots as far as the banks of Euphrates. And where and what would these "sacred dwellings of the Anunnaki" in Lebanon be? So, to the Mesopotamians of at least 2,100BC, speaking of a time at very least between 2500-2800BC, Byblos was the "the dwelling-place of the gods and the throne of Ishtar" where can be found the "sacred dwellings of the Anunnaki". Given the even longer history of interaction between Mesopotamian and Byblos, not to mention Egypt, which dates back well over 1,000yrs before even Gilgamesh's time, it stands to reason such a perception of Lebanon as being a home of the Gods dates much farther back than either of these dates. And lo and behold there in the land of the cedar forest, the home of the Gods, we find Baalbek. 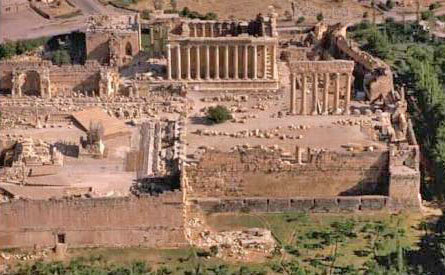 It had long been suspected that the temple of Jupiter in Baalbek was erected on an ancient tell. Recent cleaning operations in the deep trench in the courtyard of the Jupiter temple have produced evidence for occupation levels ranging from the Pre Pottery Neolithic to the Iron Age. Among the ﬁnds are several sherds which undoubtedly have to be placed in the Early Bronze Age IV [c. 2400-2000BC], such as the spout of a teapot. 18 Unfortunately no architectural remains from this period were uncovered. 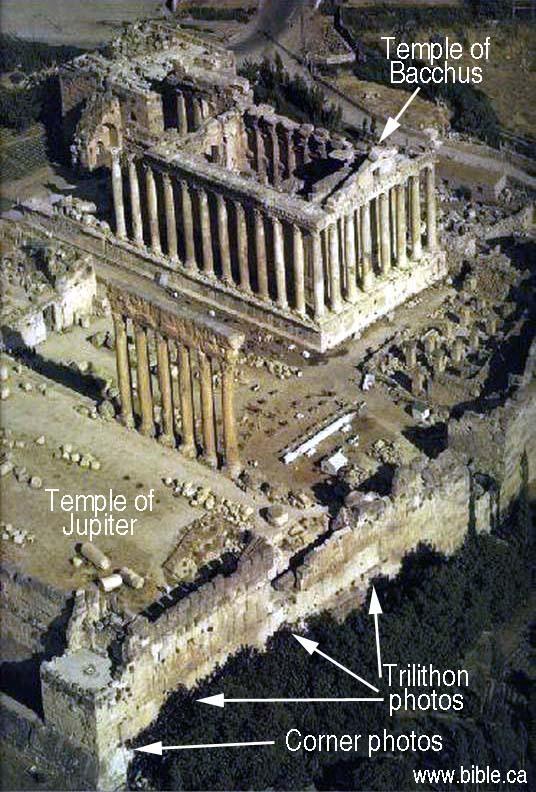 The Temple of Jupiter is the temple that sits above the Trilithon. Edited 6 time(s). Last edit at 11-Apr-18 23:15 by Thanos5150.